Destiny 2 is the best-selling console game year-to-date in the US. Half of all console full sell-through was digital, setting a new record for Activision-Blizzard. Also, Overwatch has 35 million active users. Activision-Blizzard announced today Destiny 2 was the best selling console game of the year, reiterating the latest NPD report for September 2017. Destiny 2 is well ahead of the original Destiny on time spent per player and there’s a large attach rate to the Destiny 2 Expansion Pass, according to Activision. With the launch of the game on PC, Destiny 2 is also now ahead of the original game in consumer spend. The game also bested its predecessor with more console beta participants and pre-order sales, as previously reported. On the call to investor’s Activision reiterated there will be more content developed to support Destiny 2 than content in the original Destiny, starting with the first expansion Curse of Osiris. It releases on PS4, Xbox One and PC December 5. If you missed the first trailer for Destiny 2 expansion Curse of Osiris just give that link a click and be sure to watch our breakdown of what you’re seeing in it. In its third-quarter 2017 financial report, Activision-Blizzard revealed it had 384 million Monthly Active Users (MAUs) during the quarter, down year-over-year (yoy) from 482 million million MAUs. 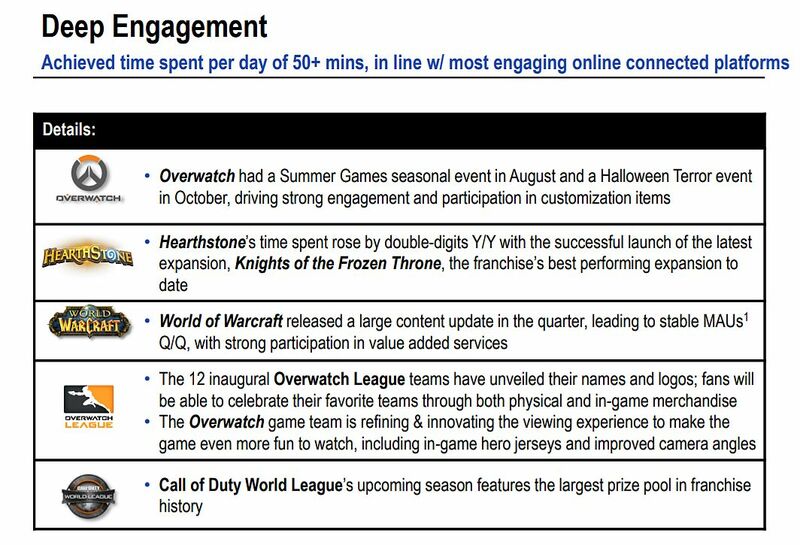 For Activision, the Q3 online player community was the largest in its history, with a record 49 million MAUs. This is up from 46 million during the same quarter in 2016. Destiny 2 is the best-selling console game year-to-date in the U.S. Digital mix was over 50% of console full game sell-through, a new record for the company. Call of Duty continued its strong momentum with record Q3 MAUs ahead of the release of Call of Duty: WW2 on November 3, 2017. Pre-order momentum has been strong for Call of Duty: WW2, with a higher percentage of pre-orders on the digital offering than prior Call of Duty titles. Blizzard had the biggest Q3 online player community in its history, with a record 42 million MAUs. This is the fourth quarter in a row that Blizzard drove quarterly record MAUs thanks to Overwatch and Hearthstone MAUs growing year-over-year. The Overwatch community grew to over 35 million registered players up from Q2 2017. 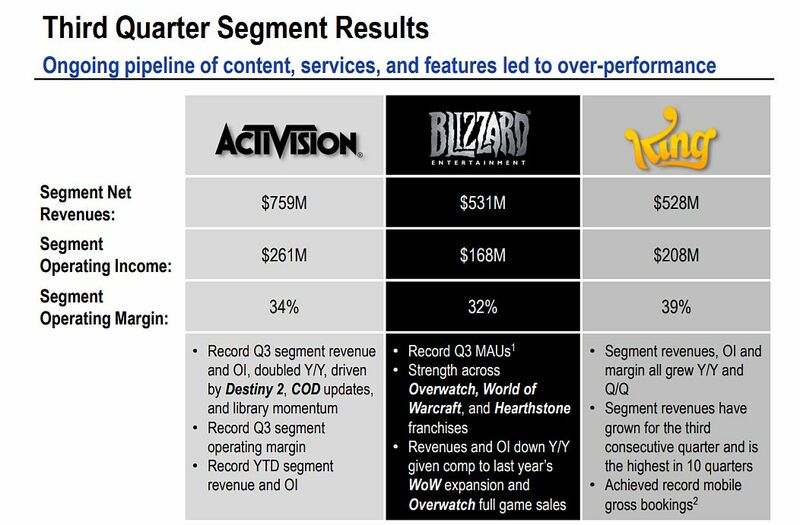 Activision Blizzard had 384 million Monthly Active Users (MAUs) in the quarter. 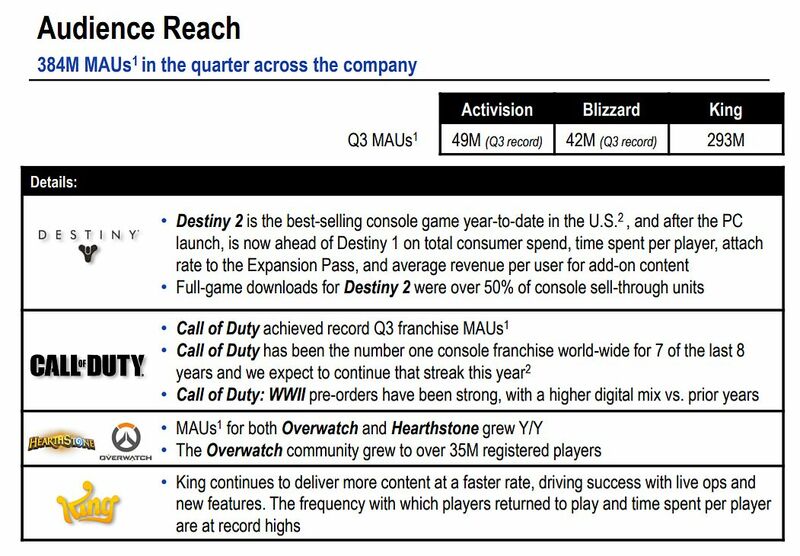 Activision had the biggest third-quarter online player community in its history, with a record 49 million MAUs. Destiny 2 is well ahead of the original Destiny on time spent per player and attach rate to the Expansion Pass. Hearthstone: Knights of the Frozen Throne expansion led to double-digit percentage growth in time spent year-over-year for the franchise. Overwatch’s Summer Games seasonal event and Halloween Terror event continued to drive strong engagement and participation in customization items. World of Warcraft’s latest update during the quarter stabilized MAUs for the franchise quarter-over-quarter. 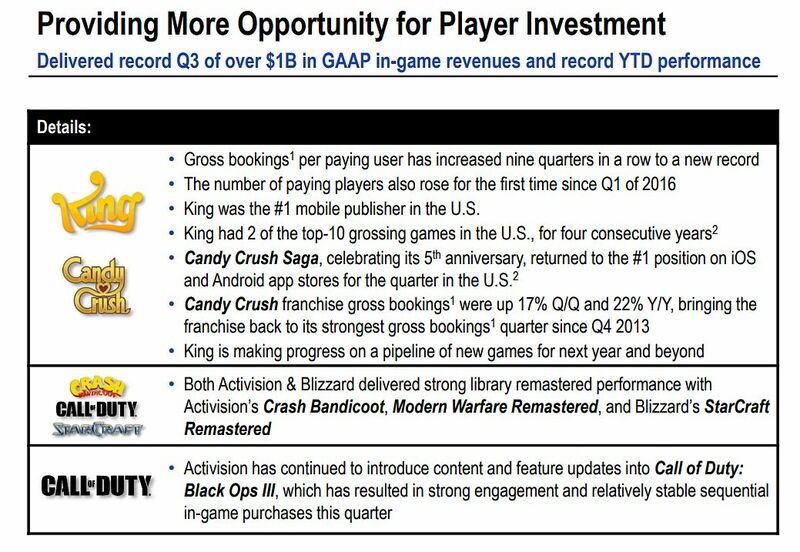 During the quarter, Activision-Blizzard delivered a Q3 record of over $1 billion of in-game revenues, with record performance year-to-date. For the quarter ended September 30, 2017, Activision-Blizzard’s net revenues were $1.62 billion, as compared with $1.57 billion year-over-year. Net revenues from digital channels were a Q3 record of $1.35 billion. 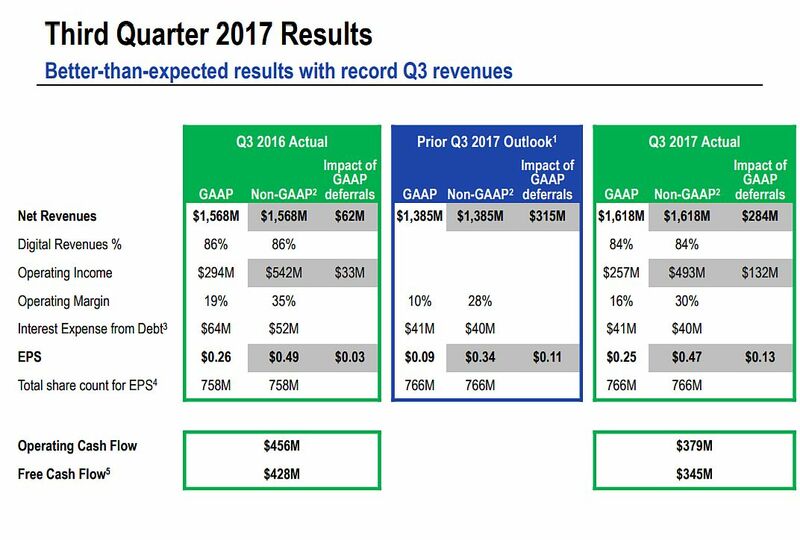 Broken down by segment, Activision reported $579 million in net revenue, Blizzard $531 million in net revenue, and King mobile division reported net revenue of $528 million.